We are a small church who loves to give thanks and praise to God, pray for one another and for others, and know the Bible. Our desire is that God's will be done through our church and that others would know Jesus as their Savior and Lord. Our services are times that we take time to give praise to God for what He has done and to pray for each other. We sing a mix of traditional hymns, Gaither gospel songs, and newer praise and worship choruses. Time is then spent opening the Bible and preaching from it God's Word as directed by the Holy Spirit. We are a mix of ages: infants and toddlers, children, some youth and college age, and the rest in their 40's, 50's, 60's, and 70's. We welcome anyone to Living Hope Church regardless of religious or non-religious background. We want everyone to know the love of God in their own lives and understand the joy of His presence in their lives. I consider it a privilege to preach God's Word and pastor Living Hope. I desire to study the Bible and listen to the Holy Spirit, as well as pray for my church family and for others. Go here? Tell us why you love Living Hope Southern Baptist Church. Visited? Tell us what a newcomer can expect. 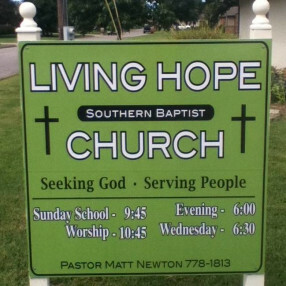 Enter your email address to receive an informative welcome email from Living Hope Southern Baptist Church.